At ECA we remain fully committed to our classical Christian approach to education. In recent years we have bolstered our ability to utilize technology in the classroom to enhance the educational process while staying committed to the classical methodologies in our teaching style. Our teachers use the internet, computer labs, and “smart-boards” to enhance their lessons when appropriate. This month I turn over the blog to our only off-campus instructor, Aaron Sams, who teaches high school chemistry in an online “Skype-type” environment. In his blog, you will hear something about his philosophical approach to educational technology. We feel blessed to have Aaron teaching for us as he is a Presidential Award Winner in Science for the State of Colorado and has been working for the Reformed Presbyterian Seminary in Pittsburgh! We did a ton of landscaping this summer at my house including a fence and a deck. The work looks great, but it left our (tiny city) yard a wasteland of trampled dirt, dying grass, piles of fill dirt from the post holes, spilled cement, a few patches of clover, and some rather zealous horseradish that snuck out of our garden. After a day of picking up the debris I decided to rent a rototiller, turn the soil, and re-seed. Having worked on a landscaping crew in college, I didn’t think this was out of my league, so off I went to Home Depot to acquire a rototiller and some grass seed. As I fired up the machine I quickly remembered that the last time I had used one of these things was when I was 19. I’m now 38…twice as old as the last time I did this, and I’m not nearly as strong as I was then. It was going to be a painful day, so I decided to distract my ailing body by outlining this post. 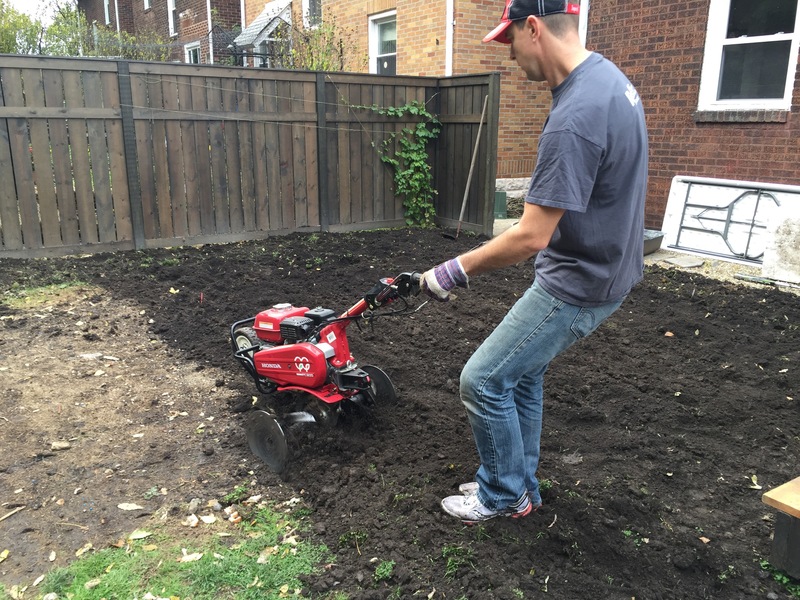 Through the pain, I concluded that rototilling was much like teaching with technology. Weigh your options. My lot is small and could have possibly been turned using a manual device of some sort, but the area is just big enough to warrant using a machine. I like toys with motors, so I opted for the machine. In our classrooms tech solutions are not always the best option. Sometimes the machine can become an unnecessary burden, but utilized properly, sometimes the machine can be a great asset. Let the machine do the work. As I began tilling the soil I noticed I was trying to strong arm the machine into doing what I thought it should be doing. I was fighting with it and was losing the battle and I was not making much progress. As teachers, we often fight with our technology. Many times this is because we either don’t fully understand what it is capable of doing, or we are trying to use a tool for something it is nog designed to do. As I relaxed a bit, dropped my weight and just guided the machine and let the tines dig away I had a much easier time, and the machine was much more productive. At this point I was feeling good, I was making progress, and I was getting aggressive with the tilling. Then I noticed I was not digging as deep as I was earlier. So I decided to call in reinforcements. I was getting overzealous and was not as productive, and my wife noticed that I was erring on the other side of things as was letting the machine do too much on its own. The machine was moving forward across the surface rather than digging deep. However, at this point I had lost the strength to hold it back, so I asked my wife to help. She stood behind me, wrapped her arms around my waist and held me back to allow the machine to dig down rather than move forward. Those of us who are early adopters of tech in our classrooms can often go too far by relying too heavily on the technology and we can loose sight of what the tech is there to do: assist with learning. So we often need a colleague to hold us back and keep us from chasing after shiny objects. We need our peers to wrap their arms around our waists lean back, dig their heels in and prevent the machines from running away with us simply holding on for dear life. Go analog when appropriate. The tilling was done, and the machine had served its purpose. I hosed it off and took it back to the store. Next up: raking out the dirt and seeding. Now that I had subdued the earth, I was left with uneven piles of dirt containing big chunks of dirt and sod. Not exactly the surface my kids want for playing tag or croquet. So, I grabbed my rake and went to town…old school…by hand…and it felt good. Over the next few days I would take out the clumps, smooth the surface, water it a bit to make the dirt settle, lather, rinse, repeat. I’m sure I could have found a small tractor with a rake on it and done this in a couple of hours, but that would have been overkill for my tiny yard. Instead, I opted for the manual approach that took much longer…days longer, but that was ok. That was the best tool for the job. Teachers, don’t be afraid of paper. Don’t go paperless, go less paper. Chalk is ok, pencils are fine, physical books are just as good as e-books. Don’t fall into the trap of digitizing everything if an analog solution is better, or simply more convenient. At this point I’ll avoid the overdone analogy of planting seeds and watering them as a reflection of good teaching, and instead, just encourage you to think carefully about your tech choices. Where is your balance between analog and digital, physical and virtual, human and machine?